The Lamborghini Huracán (Spanish for "hurricane"; [uɾaˈkan]) is a sports car manufactured by Italian automotive manufacturer Lamborghini replacing the previous V10 offering, the Gallardo. The Huracán made its worldwide debut at the 2014 Geneva Auto Show, and was released in the market in the second quarter of 2014. The LP 610-4 designation comes from the fact that this car has 610 metric horsepower and 4 wheel drive, while LP stands for "Longitudinale Posteriore", which refers to the longitudinal mid-rear engine position. The Huracán's name (huracán being the Spanish word for hurricane) is inspired by a Spanish fighting bull. Names from historical Spanish fighting bulls has been the traditional naming scheme of most Lamborghini car models. Huracán was a bull known for its courage that fought in 1879. Also Huracan is the Mayan god of wind, storm and fire. The Huracán maintains the 5.2-litre naturally aspirated Audi/Lamborghini V10 engine from the Gallardo, tuned to generate a maximum power output of 449 kW (602 hp; 610 PS). To ensure its balance and performance, the car is mid-engined. The engine has both direct fuel injection and multi-point fuel injection. It combines the benefits of both of these systems; it is the first time this combination is used in a V10 engine. To increase its efficiency, the Huracán's engine also includes a start-stop system. With a curb weight of 1,553 kg (3,424 lb), the Huracán LP610-4 has a power-to-weight ratio of 2.55 kg (5.62 lb) per horsepower. The Huracán has an electronically controlled all-wheel drive system, which aims to increase the traction on various surfaces and the overall performance of the car. The car has a 7-speed dual clutch transmission, Lamborghini's new 'Doppia Frizione' (Dual Clutch) gearbox. The transmission performs differently depending on the mode the driver has selected. The Huracán will only be available with an automatic transmission; a manual will not be offered. The Huracán also has a magnetically controlled suspension system. It utilises magnetorheological dampers to very quickly change how the suspension acts, ensuring performance as well as usability. The Huracan has various components in common with the second generation of the Audi R8. This is due to the sharing of Volkswagen's sports car technology among both of the cars. The Huracán has various interior options for more comfort inside the car. It has a choice for full electric control and heating of the sport seats in addition to the standard lengthwise alignment and electric backrest. The car also has an optional navigation system and leather upholstering. The Huracán is one of the first sports cars moving the infotainment system out of the center stack: Lamborghini Infotainment System. The result: a display that lets the driver decide what they want to see. It is the first Lamborghini automobile to use the 12.3 inch TFT virtual cockpit from parent company Audi, which is available with high-definition (1440 x 540) 3D computer graphics, Bluetooth, Google Earth GPS navigation and Multi Media Interface-like menu and dashboard controls, all powered by Nvidia Tegra 3. Various aspects of the Huracán are technologically advanced. The car has full LED headlamps, which ensure higher contrast in night conditions. Also, the Huracán has optional "Lamborghini Dynamic Steering" (LDS) to add to the standard power steering. The Dynamic Steering changes the steering performance from normal, comfortable steering to a racing feeling. The main control for changing the car's performance according to driving conditions is the mode selector ANIMA (Adaptive Network Intelligent Management). ANIMA controls the engine, the transmission, LDS, the all-wheel drive, magnetorheological suspension, and the electronic stability control. The Lamborghini Piattaforma Inerziale (LPI) carries out precise measurements of the vehicle movements using on board sensors (3 accelerometers and 3 gyroscopes) linked to ANIMA via high-speed FlexRay CAN bus. The driver can select street, sport, or race mode to alter how systems like the engine or transmission respond while driving. Changes from Gallardo included full LED illumination, a 12.3 inch full-colour TFT instrument panel, Fine Nappa leather and Alcantara interior upholstery, redesigned dashboard and central tunnel, Iniezione Diretta Stratificata (IDS, essentially an adapted version of parent Audi's Fuel Stratified Injection) direct and indirect gasoline injections, engine Stop & Start technology, EU6 emissions regulation compliance, Lamborghini Doppia Frizione (LDF) 7-speed dual-clutch transmission with 3 modes (STRADA, SPORT and CORSA), 20-inch wheels, carbon-ceramic braking system, optional Lamborghini Dynamic Steering variable steering system and MagneRide electromagnetic damper control. The main competitors of the Huracán include the McLaren 650S (as well as the 720S), the Audi R8, the Ferrari 458 Speciale and the 488 GTB. Extra options that increase the price of the car include interior enhancements, special paint schemes, improved suspension, and a lifting system, as well as multiple components optionally available in carbon fibre, rather than aluminium. Taiwan models went on sale for NT$15,080,000. The Huracán LP 610-4 Polizia is the official police car variant specifically produced for the Italian State Police, after the two Gallardos used by the Polizia Stradale were destroyed in the course of patrol duty. This model sports various features exclusive to the car, such as blue Polizia body colour, white stripes and lettering following the Huracán's dynamic design language, a video system positioned in the centre of the cabin with a camera fitted next to the rear view mirror, a police computer, recording equipment behind the seats, a Proof Video Data System, gun holster, police radio equipment, a Paletta (the traditional hand-held stop sign used to advise motorists and traffic offenders to pull over), a removable screen, a refrigeration system at the luggage compartment in the front of the vehicle (for use in the vehicle's role in transporting organs for transplantation), a defibrillator, and a police beacon with blue LEDs around the base and white LED signals on the front, sides and rear of the light's aluminium shell. Unveiled at the 2016 Geneva Motor Show, the Avio is the first limited edition of the Huracán, bringing new colours, upholstery, exterior decals and interior logos inspired by the Italian fighter jets along with featuring a tricolore cockade in Red, White and Green. On the centre console there is a plaque indicating the limited number from 250 examples offered. 2 emission of about 280 g/km. Unveiled at the 2016 Geneva Motor Show, the Huracán LP 580-2 is a lower cost derivative of the Huracán LP 610-4 that differs mostly in having the 5.2 L V10 engine detuned to 427 kW (572 hp; 580 PS) and 533 N⋅m (393 lb⋅ft) of torque along with having a rear wheel drive drivetrain instead of the all-wheel drive drivetrain found in the standard Huracán. Lamborghini claims the car will accelerate from 0–100 km/h (0–62 mph) in 3.4 seconds and 0–200 km/h (0–124 mph) in 10.1 seconds. The top speed is claimed to be as high as 320 km/h (199 mph). It also features slight visual differences to the standard variant of the car - with a different front fascia and larger air vents at the rear of the car for improved brake cooling. The seven-speed dual-clutch transmission is the same as used in the standard LP 610-4. The base level LP 580-2 costs US$201,100, about US$40,000 less than the base level LP 610-4. Lamborghini specially manufactured a tailor made Huracán LP 580-2 and donated it to Pope Francis before the general audience in the presence of the top management of the company. The exclusive and personalized car, signed by the Pontiff, was auctioned out by Sotheby's and the proceeds were delivered directly to the Holy See which will allocate the charitable sum for the reconstruction of the Nineveh Plain through the Foundation of Papal Law "Aiuto alla Chiesa che Soffre". A convertible variant of the Huracán LP 580-2 was unveiled at the Los Angeles Auto Show on 16 November 2016. The 5.2-litre naturally-aspirated V10 engine is the same as in the coupé, and generates a maximum power output of 427 kW (572 hp; 580 PS). 0 to 100 km/h (62 mph) takes 3.6 seconds and the top speed is 320 km/h (199 mph). A track oriented variant of the Huracán, called the Performante, was unveiled at the 2017 Geneva Motor Show. The Performante underwent various exterior changes with the most noticeable being the front and rear bumpers. Carbon fibre is used for the bumpers and the side skirts. An adjustable carbon fibre rear wing has been added to increase downforce. The position of the exhaust has also been changed, and is now just a bit above the rear diffuser. The interior also underwent noticeable changes, now sporting new seats and a new digital speedometer (similar to that of the Aventador SV's speedometer). The Performante's 5.2-liter V10 has been tuned to have a power output of 471 kW (631 hp; 640 PS) at 8,000 rpm and 601 N⋅m (443 lb⋅ft) of torque at 6,500 rpm. The weight has also decreased by 40 kg (88 lb), courtesy of the forged aluminium and forged carbon fibre body components (first used in the construction of the Sesto Elemento). All the new aero components on the car have active aerodynamic capability and help keep the car stable at high speeds. The Performante is capable of accelerating from 0–100 km/h (0–62 mph) in 2.9 seconds and 100–200 km/h (62–124 mph) in 6 seconds and has a theoretical top speed of 351 km/h (218 mph). The car has been stiffened by 10% with new springs, roll bars, and radial axial arm bushings. The magnetorheological suspension has been reworked to give a driver a serious track experience. The Lamborghini Dynamic Steering has been re-calibrated. The Performante utilises Lamborghini's new ALA (Aerodinamica Lamborghini Attiva) system, which is said to be 80% lighter than regular sports car hydraulic systems. According to Lamborghini, ALA is also said to provide 750% more downforce than the standard Huracán. The price of the car is set at US$274,390. In October 2016, a prototype of the Performante set a lap time of 6:52.01 on the Nürburgring Nordschleife, with Marco Mapelli behind the wheel, making it one of the world's fastest production cars around the track. This lap was also made on Marco Mapelli's first attempt. However, some critics have stated complaints around the car's lap time, from the official video being sped up to make the lap believable, to the speeds displayed in the video being false or that it did not use road tires. However, Lamborghini was able to prove that the lap the Performante did was fully legitimate exactly a week after the lap around the Nordschleife when they revealed the data to car website, Road & Track. Máté Petrany of R&T had met with lead engineer of Lamborghini, Maurizio Reggiani, to ask about the lap. It was then revealed by Reggiani that the Performante's active aerodynamic system called Aerodinamica Lamborghini Attiva is what gives the car the greatest improvement in lap time. What is more important is the spoilers snapping into their lowest-drag setting when the Performante is aimed forward, which results in the removal of acceleration impediment that big aero causes. The Huracan Performante's lap time was beaten by the Porsche 911 GT2 RS which set a lap time of 6:47.3 in September 2017. The Lamborghini Huracán Performante Spyder was unveiled at the 2018 Geneva Motor Show. It takes much of the styling inspiration from the coupé and the outgoing LP 610-4 Spyder. The Spyder is identical to the coupé from performance and technological standpoint, but the acceleration time from 0–97 km/h (0–60 mph) has risen by one-tenth of a second and stands at 3.1 seconds while the 0–200 km/h (0–124 mph) has risen by four-tenths of a second and stands at 9.3 seconds. Due to the loss of the roof, the Spyder weighs 125 kg (276 lb) more than the coupé due to chassis reinforcing components. Top speed remains the same as well and stands at 325 km/h (202 mph). Deliveries of the Spyder began in the fourth quarter of 2018. The Huracán received a mid-cycle update in 2019, now being called the Huracán Evo. It now shares its engine and some of the technology with the Performante variant. The updated version of the Huracán has a more aggressive design language, the new front bumper has integrated aeroblades for improved downforce along with the rear styling inspired by the Performante variant, having the same rear diffuser, exhaust pipe position and radiators. A new ducktail spoiler improves downforce by 5 times as compared to the outgoing model. The engine is shared with the Performante and generates 471 kW (631 hp; 640 PS) at 8,000 rpm and 601 N⋅m (443 lb⋅ft) of torque at 6,500 rpm. The exhaust system is more refined and has titanium intake valves. This allows the car to achieve a 0–97 km/h (0–60 mph) acceleration time of 2.9 seconds, 0–200 km/h (0–124 mph) acceleration time of 9 seconds and a top speed of 325 km/h (202 mph). The car has a braking distance from 100–0 km/h (62–0 mph) of 104 ft (32 m). The Huracán Evo has a rear-wheel steering system for improved handling and a torque vectoring system. A new central processing unit controls the various functions of the car and monitors various settings. The control system is controlled by the new infotainment system (via an 8.4 inch touchscreen) dubbed the Lamborghini Dinamica Veicolo Integrata which has integrated both Apple CarPlay and Android Auto. The infotainment system predicts the driving modes by a feed forward logic. The feed forward logic works by sensors monitoring the lateral, longitudinal and vertical accelerations, as well as roll, pitch and yaw rate to predict the best possible driving mode for the driver. The magnetorheological suspension is also revised and now uses electromagnetic current to adjust the suspension system in accordance with the driving mode. The transmission system from the outgoing model is retained which transfers power to all four wheels. A new Ego mode allows the driver to change driving settings to his own preference. The Huracán Evo Spyder was introduced online in February 2019. The Spyder has the same enhancements as the coupé but is 100 kg (220 lb) heavier due to the addition of chassis reinforcement components owing to the loss of the roof. The car has the same canvas folding soft top as the outgoing model which takes 17 seconds for operation and is operable at speeds up to 50 km/h (31 mph). The Spyder can accelerate to 100 km/h (62 mph) in 3.1 seconds from a standstill, to 200 km/h (124 mph) in 9.3 seconds and can attain a top speed of 325 km/h (202 mph). The Huracán's chassis is assembled by Lamborghini's parent company Audi in Neckarsulm, Germany. It is transported to the Lamborghini headquarters in Sant'Agata Bolognese, Italy, where the final assembly occurs. Within the first month of the Huracán LP 610-4 preview period, 700 orders of the vehicle were obtained. Before the official launch, Lamborghini registered more than 1,000 orders of the Huracán LP 610-4. The Huracán LP 610-4 Coupé (in Midas yellow body colour) appeared in Forza Horizon 2 as the "hero car", where the car was featured in the box art cover for both the Xbox One and Xbox 360 editions of the game. At Penny Arcade Expo 2016, the Blizzard Entertainment game "Overwatch" collaborated with Uber to perform "Uberwatch", which took event goers and VIP's on short rides through the area surrounding the BCEC, in cars themed after as well as driven by stunt performers cosplaying as various characters from the game. Huracáns and Aventadors were wrapped in liveries themed after the character "Tracer", with 3 cars (two Huracáns and one Aventador) being driven on the street, while the remaining Aventador was on display inside the convention. For the 2016 Marvel Studios film Doctor Strange, Lamborghini gave Marvel Studios 6 grey Lamborghini Huracáns, 2 for stunts, 2 for special effects, and 2 "hero ones". The Huracáns were featured in the car crash scene in that movie. Multiple versions of the Lamborghini Huracán are available from various scale model manufacturers such as AUTOart in 1/18, 1/24 and 1/32 scale. In early 2015, the Huracán appeared on the motoring magazine Top Gear. It got a neutral review from Richard Hammond who said that it was too tame to be a "proper Lamborghini." However, it got around the Top Gear test track in 1:15.8 which is faster than any other Lamborghini to go around the track to date, including the Aventador. The Huracán was named "The Supercar of the Year 2014" by automotive magazine Top Gear. 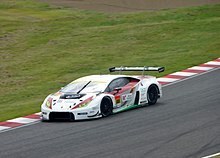 The Huracán LP 620-2 Super Trofeo is a rear wheel drive racing version of Huracán coupe for the 2015 Lamborghini Blancpain Super Trofeo Series (Europe, Asia and North America). The vehicle was unveiled at the ACI Vallelunga Circuit. Introduced in 2015, The Lamborghini Huracán GT3 was developed in collaboration with Dallara. It features the 5.2 L V10 gasoline engine of the standard car and has a weight of 1,230 kg (2,712 lb). Team Lazarus won the 2016 International GT Open with drivers Thomas Biagi and Fabrizio Crestani. Also, Barwell Motorsport claimed four wins in the 2016 British GT Championship, Grasser Racing Team won a race at the 2016 ADAC GT Masters, and Paul Miller Racing got a win at the 2016 WeatherTech SportsCar Championship. On January 28, 2018 on the first race of the 2018 WeatherTech SportsCar Championship, the No. 11 Lamborghini Huracán GT3 of GRT Grasser Racing Team finished 1st at the 2018 24 Hours of Daytona in the GTD class. It was the first time that Lamborghini has won a 24-hour race in history. The No. 48 Huracán of Paul Miller Racing went on to win the drivers, teams, and manufacturers championships for Lamborghini. ^ Pattni, Vijay (2017-12-12). "'Project Panther' is a new Italian supercar with a Lambo base". Top Gear. Retrieved 2018-04-27. ^ a b c d e f "Lamborghini Huracan LP610-4" (PDF). Car and Driver. 2014. Retrieved 2015-11-10. ^ Undercoffler, David (2013-12-20). "Lamborghini's 610-horsepower Huracan will succeed Gallardo". Los Angeles Times. Retrieved 2013-12-20. ^ Estrada, Zac (2013-12-20). "The Lamborghini Huracan LP610-4 Is The Most Advanced Lambo Ever". Jalopnik. Gawker Media. Retrieved 2013-12-20. ^ Frank, Robert. "Lamborghini's Huracan: A new weapon in the supercar wars". CNBC. Retrieved 2014-02-09. ^ Kaye, Ken. "Thank Mayan god for the word 'hurricane'". Sun-Sentinel.com. Retrieved 2019-02-08. ^ Goodwin, Antuan. "Lamborghini unveils 610hp Huracán luxury super sports car". CNET. CBS Interactive. Retrieved 2013-12-20. ^ Remenár, Miloš. "Lamborghini Huracán: Z 0-300 km/h pod pol minúty". Autoviny. ^ "Lamborghini Huracán LP610-4". Automobilismo. 2015. Retrieved 2016-07-16. ^ a b "Hitting 212 mph In A Lamborghini Huracan On The Autobahn". duPont Registry. 2016. Retrieved 2016-07-16. ^ "Lamborghini Huracán Coupè". www.lamborghini.com. Retrieved 2017-09-27. ^ "Lamborghini Huracán Spyder - Technical Specifications, Pictures, Videos". www.lamborghini.com. Retrieved 2017-09-27. ^ "Lamborghini Huracán Rwd - Technical Specifications, Pictures, Videos". www.lamborghini.com. Retrieved 2017-09-27. ^ "Lamborghini Huracán Rwd Spyder- Technical Specifications, Pictures, Videos". www.lamborghini.com. Retrieved 2017-09-27. ^ "Lamborghini Huracán Performante". www.lamborghini.com. Retrieved 2017-09-27. ^ "Lamborghini Huracán Performante Spyder". www.lamborghini.com. Retrieved 2018-03-14. ^ "Lamborghini Huracan Driven!". BTvIn. 2014-06-10. Retrieved 2014-06-11. ^ a b c d "Huracan LP 610-4". Lamborghini. Retrieved 2014-02-09. ^ a b Stoklosa, Alexander. "2014 Lamborghini Huracán LP 610-4: Succeeding Supercar Ubiquity". Car and Driver. Retrieved 2014-02-19. ^ a b c d e "Lamborghini Huracán LP 610-4: The New Benchmark among Luxury Super Sports Cars". Automobili Lamborghini S.p.A. (Press release). 2014-03-03. Archived from the original on 2015-03-01. Retrieved 2015-01-15. ^ Okulski, Travis (2014-05-01). "The Lamborghini Huracan Is The Real First Use Of Audi's Virtual Cockpit". Jalopnik. Retrieved 2015-01-14. ^ a b Kane, J.D. (2014-03-05). "Lamborghini's Newest Supercar is Equipped with NVIDIA's Tegra 3 Tech". Techgage. Retrieved 2015-01-14. ^ "Lamborghini Huracan LP610-4 (2015)". Retrieved 2015-01-14. ^ Philip, Sam. "Official: this is the Lambo Huracan". Top Gear. BBC. Retrieved 2014-02-16. ^ "Lamborghini Huracán Price". HR Owen. Archived from the original on 2015-02-08. Retrieved 2015-02-08. ^ Anderson, Brad. "Lamborghini Huracan Pricing Details Revealed". The Supercar Kids. GTspirit.com. Retrieved 2014-02-20. ^ Tingwall, Eric. "2015 Lamborghini Huracán LP610-4". Car And Driver Magazine. Car And Driver. Retrieved 2014-08-02. ^ Zhang, Wei-Yang (2014-07-22). "颶風狂牛、1,508萬元起襲臺，Lamborghini Huracán LP 610-4發表" [Hurricane bull, 1,508 yuan in Taiwan, Lamborghini Huracán LP 610-4]. u-car.com.tw (in Chinese). Taiwan. Retrieved 2014-08-02. ^ "Lamborghini donates Huracán to Italian police". Autoblog. ^ "Lamborghini hands over the new "Huracán LP 610-4 Polizia" to the Italian State Police". Automobili Lamborghini S.p.A. 2014-05-22. Archived from the original on 2014-12-05. Retrieved 2015-01-15. ^ "Lamborghini Huracán LP610-4 Avio Honors Flight as Only a Supercar Can". Retrieved 2017-09-27. ^ "Huracán LP 610-4 Avio". Automobili Lamborghini S.p.A. 2016-04-05. Retrieved 2016-04-05. ^ "2016 Lamborghini Huracan LP 610-4". Lamborghini S.p.A. Retrieved 2018-01-24. ^ "Less is more in the tail-happy Huracan LP 580-2, a Lambo designed to drift". Digital Trends. Retrieved 2016-01-24. ^ Hyde, Justin (2015-11-18). "Lighter, Less Expensive Lamborghini Huracan LP 580-2 Unveiled". Yahoo! Autos. Retrieved 2015-12-01. ^ Perkins, Chris (15 November 2017). "Special Huracan made for the Pope". road and track. Retrieved 24 January 2017. ^ Stocksdale, Joel (2017-03-06). "This is the fully uncovered Lamborghini Huracán Performante". AutoBlog. Retrieved 2017-03-06. ^ "2017 Geneva Motor Show: Lamborghini to showcase Huracan Performante". FirstPost. 2017-01-26. Retrieved 2017-03-04. ^ Fung, Derek (2017-03-06). "Lamborghini Huracán Performante revealed, coming to Australia in winter". Car Advice. Australia. Retrieved 2017-03-06. ^ Klein, Jonathon (2017-03-06). "Lamborghini Huracan Performante Revealed, Delivers 640 HP". MotorTrend. USA. Retrieved 2017-03-07. ^ Lamborghini (2017-03-01). Lamborghini Huracán Performante record at the Nürburgring. Retrieved 2017-03-12. ^ Smith, Luke John (2017-03-03). "New Lamborghini Huracan - You won't believe what this super car has just done". Express. UK. Retrieved 2017-03-04. ^ Sellmeyer, Des (2017-03-03). "Something Isn't Right with the Lamborghini Huracan Performante Nurburgring Record Video". GT Spirit. Retrieved 2017-03-04. ^ "Blog: Did Lambo "fake" that laptime?". Bridge To Gantry. 2017-03-03. Retrieved 2017-03-04. ^ Roadshow (2017-03-08). Jim Glickenhaus is cynical of Lamborghini Performante record. Retrieved 2017-03-26. ^ "Why Skeptics Doubted Lamborghini's Nurburgring Record, And How Lambo Proved Itself". Road & Track. 2017-03-10. Retrieved 2017-03-12. ^ "Porsche 911 GT2 RS breaks Nürburgring record with 6:47.3 lap time". MotorMag.com.au. Retrieved 2018-01-24. ^ Towler, Adam (2018-03-06). "Lamborghini Huracán Performante Spyder revealed at the 2018 Geneva Motor Show". Evo magazine (Press release). Retrieved 2018-03-14. ^ Katsianis, Jordan (2019-01-07). "Lamborghini Huracan EVO revealed - updated junior supercar to fight McLaren 570S". Evo. Retrieved 2019-02-09. ^ Bigger, Martin (2019-01-07). "Say Hello To The New Lamborghini Huracan Evo". Carbuzz. Retrieved 2019-01-07. ^ Kew, Ollie (2019-01-07). "This is the new Lamborghini Huracán Evo". Top Gear. Retrieved 2019-01-07. ^ Kew, Ollie (2019-02-26). "The Lamborghini Huracán Evo: now available minus a roof". Top Gear. UK. Retrieved 2019-02-26. ^ Holmes, Jake (2019-03-05). "Lamborghini Huracan Evo Spyder revealed ahead of Geneva Motor Show". CNET. US. Retrieved 2019-03-19. ^ Gomoll, Wolfgang (2014-03-26). "Wieviel Audi steckt im Lamborghini Huracan?". Focus (in German). Retrieved 2016-03-04. ^ "Lamborghini has already pre-sold 700 Huracans". Autoblog. ^ "Aventador sales drive record revenue at Lamborghini". Autoblog. ^ "Volkswagen Group Annual Report 2013" (PDF) (Press release). Volkswagen. p. 27. Archived from the original (PDF) on 2014-03-14. Retrieved 2014-03-30. ^ a b "Smart Factory – the digital production of the future" (Press release). Audi. 2017-03-15. Retrieved 2017-11-11. ^ "Lamborghini Huracán LP 610-4 the hero car of Forza Horizon 2". Automobili Lamborghini S.p.A. 2014-06-10. Archived from the original on 2014-12-16. Retrieved 2015-01-15. ^ Berk, Brett (2016-10-20). "Why Did Lamborghini Give Marvel a Huracán to Destroy in Dr. Strange?". Bloomberg. UK. Retrieved 2017-11-24. ^ Lamborghini and Doctor Strange: behind the scenes. Retrieved 2017-11-24 – via YouTube. ^ "scale models of the Lamborghini Huracan". the Lamley Group. 2015-02-26. Retrieved 2018-02-02. ^ "What's Top Gear's Car of 2014?". Top Gear. 2014-12-03. Retrieved 2016-12-06. ^ "Huracán LP 620-2 Super Trofeo". Lamborghini. Retrieved 2015-01-14. ^ Joseph, Noah (2014-07-17). "Lamborghini previews new Huracán Super Trofeo". autoblog.com. Retrieved 2014-08-23. ^ "'Amazing' finish nets GTD crowns for Sellers, Snow and Lamborghini". Racer. US. 2018-10-15. Retrieved 2018-10-31. 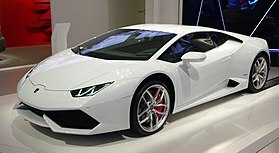 Wikimedia Commons has media related to Lamborghini Huracán.